By Kori ~ June 5th, 2009. During these tough economic times, itâ€™s refreshing to see creative marketing combined with an environmentally friendly concept. And thatâ€™s exactly what we found recently when we visited Pend dâ€™Oreille Winery in Sandpoint, Idaho. We learned that since February, their popular Bistro Rouge Red Table Wine has been available in a refillable 1.5 liter bottle. You buy the first 1.5 liter bottle, sealed with a cork, for $25; then refills, sealed with a T-stopper, are $16 thereafter. The idea came from co-proprietor Julie Meyer who was frustrated seeing glass from Sandpoint getting reintegrated into other solid waste after being sorted by residents and ultimately disposed of at a landfill in Eastern Oregon. The staff at Pend d’Oreille Winery brainstormed the problem and came up with the concept of producing 1.5 liter bottles with a generic silk screened label of the Bistro Rouge Red Table Wine. Once purchased, the customers clean their own bottle and bring it back to the winery for a refill. Because it is a generic label, the blend can change. Winemaker Steve Meyer loves the freedom to create wines that are fun to blend, market, and enjoy with the public. I would think that many wineries in large urban settings producing a large volume red (or white) table wine and who get a lot of traffic through their tasting rooms could make this idea work on a larger scale than even Pend dâ€™Oreille. The only part of the Pend dâ€™Oreille model that I question is the customer cleaning his or her own bottle. It seems to me that a swap-out system like you often see with propane tanks, turning in an empty one for a full one, would be a more efficient and sanitary solution. What do you winemaker readers think about this idea? Would it work for you? What about the wine lover readers? Would you like to participate in such a program with your favorite local table wine producer? This is a great green idea for wine lovers… to encourage participation a list of local participating wineries could be published online. I think this would be well received in metro Seattle and Portland. I very much agree with what Faith had to say above. I think programs like these would be accepted all over. 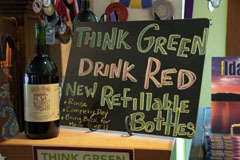 Not only is it green, but it also lowers the cost of drinking wines regularly. It’s also a great way for smaller local vineyards to attract a new potential client base. Restaurant owners could partner with a local winery and provide wines at a lower cost and eco-friendly manner to their diners. I agree that this would be well received in Seattle and Portland as well as other urban areas. Wonder if there is interest from wineries in those areas to give it a try. Interesting idea for wineries and restaurants to work together on this. I’d be interested in a restaurant owners take on this idea. I’m wondering if they may feel that this would cut into their profit margin on wine. Great idea. Our winery, Left Foot Charley, in Traverse City Michigan kicked off a similar program last Feb. We also stock 1 liter growlers for four of our wines. These wines are served directly from the tanks. This includes our glass pours and tasters too. It saves a lot of glass and the local community loves it. You see it all over Europe. Thanks for sharing, Bryan. I’m glad to hear that your winery is utilizing a similar program and that it has been well received. I hope more and more wineries give programs like this a try. Keep up the good work. Cheers!